“Look at these tall, beautiful buildings. I have worked as a mason during the construction and was one of those who laid [the brickwork] brick by brick,” says Mohammed Akhtar* who has been working as mason for over a decade in Dubai, United Arab Emirates (UAE). 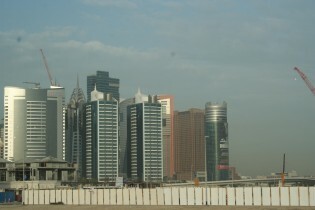 Akhtar has seen the evolution of Dubai’s skyline over time. “It has been an overwhelming journey.” When asked what has changed in the last 10 years, Akhtar smiles and says the weather. Argentina and the United Arab Emirates (UAE) agreed Friday Mar. 17 to explore the possibility of this South American country receiving investment from the Gulf nation, particularly tourism and health, while they pledged to strengthen bilateral relations and increase trade. The foreign minister of the United Arab Emirates (UAE), Sheikh Abdullah bin Zayed Al Nahyan, made his fifth visit to Brazil Thursday, Mar. 16, in search of new opportunities to exploit the enormous potential in relations between the two countries. In the Al Quoz industrial area of Dubai in the United Arab Emirates (UAE), a number of medium and large-sized buses can be spotted transporting workers clad in company uniforms to distant worksites early in the morning. In the evening or, in certain cases, late at night, these workers are brought back to labour camps in the same buses. A visit by United Arab Emirates Foreign Minister Sheikh Abdullah bin Zayed Al Nahyan to Costa Rica paved the way for closer trade ties between the two countries, especially in the areas of tourism and sustainable energy. The visit by the United Arab Emirates foreign minister, Sheikh Abdullah bin Zayed Al Nahyan, to Panama ended Thursday Feb. 11 with the creation of a novel Joint Cooperation Committee on trade and investment. The new government of Argentina and the United Arab Emirates (UAE) are strengthening the relationship established by the previous administration, at a time when this South American country is seeking to bring in foreign exchange, build up its international reserves and draw investment, in what the authorities describe as a new era of openness to the world. She only turned nine last June. But Mahra Mustafa has become a celebrity at the Expo Milan. She stars as Sara in ‘The Family Tree’, a short film on the UAE’s heritage being screened at the United Arab Emirates pavilion. Sara is in fact the face of young, dynamic and innovative Emirates. When the government of Kenya hosted a U.N. Conference on New and Renewable Sources of Energy in Nairobi back in 1981, one of the conclusions at that meeting was a proposal for the creation of an international agency dedicated to renewable energy. The United Arab Emirates is cracking down on hate crimes with tough legislation that prescribes up to 10 years in prison or the death penalty if convicted of "takfirism" or Sunni Muslim extremism, according to the text of the decree distributed by the official WAM news agency. People covered their bodies with mud to protest against government ineptitude and abandonment; others lighted paper lanterns and candles and released white doves and balloons to remember the dead, offer thanks and pray for more strength to move on; while many trooped to a vast grave site with white crosses to lay flowers for those who died, and to cry one more time.